In short, no, not really. But that doesn’t mean the situation is good. It’s not a security hole, per se, but rather just one of many routes a malicious application could take if it wanted to do something bad. Once you launch an application, it can pretty much do anything it wants within the confines of your home folder: read your mailboxes, delete the contents of your Documents folder, and, yes, surreptitiously add items to your InputManagers folder. But an app can just as easily add items to any sub-folder in your Library folder, including other code resource plug-ins like QuickTime components, OSA scripting additions, (a.k.a. OSAXen), and contextual menu items. Any of these items could be used for nefarious purposes just as easily as input managers — and any of them could be installed by any running application at any time. Could being the operative word. The expected behavior of any application that wants to install any system-wide extension is that it should ask permission first; apps that behave otherwise should be shunned. But the system doesn’t enforce this, and I’m not sure it could, other than to change the ownership or permissions on these folders such that even administrator users would have to authenticate before adding items to them. That may well be “safer”, but it’s also more complex; the ownership and permissions of all folders within your home folder have always been nice and simple on Mac OS X: you own them, and you can read and write to any of them. One thought that occurred to me was that Apple should definitely suppress the loading of any invisible items in the magic auto-loading code extension folders. An app with deeply nefarious intentions should not be able to install, say, an input manager and make it invisible so that it doesn’t appear in the Finder. Good: Input managers whose names begin with a dot — the traditional Unix way of marking a file “invisible” — are not loaded. Bad: Input managers whose HFS invisible bit is set — the real Mac way of marking a file invisible — are loaded. This seems like an oversight, if not a bug. If it’s a good idea to suppress some “invisible” input managers, the system should suppress them all. And I can’t think of a single legitimate reason why anyone would want invisible input managers (or contextual menu items, QuickTime components, or scripting additions) to load. Would you like to install Smart Crash Reports? 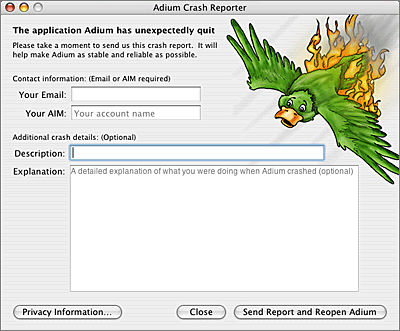 Smart Crash Reports helps improve software by notifying its developers of problems when they happen. Participation is voluntary, but your support helps make our software better. For more information, visit http://smartcrashreports.com/. This is a welcome change, and addresses my main argument directly: system-wide extensions should never be installed without the user’s permission. I would argue, however, that Unsanity’s description of Smart Crash Reports, both in the dialog box on their web site, does not make clear just what exactly it is: an input manager bundle installed in ~/Library/InputManagers/. Simple “how to uninstall” instructions in the Smart Crash Reports FAQ would do the trick. There is currently no way for third party developers to access the reports submitted via CrashReporter. Apple is aware that there is strong demand for such a facility (r. 3356232). Regardless, your users can still submit crash logs to you manually. Moreover, there’s no reason why your application couldn’t look at its crash log on each launch and, if it has changed, ask the user whether they want to submit it to your bug tracking system. BugReporter is a developer tool that allows applications to automatically invoke a bug-reporting system in the event of a crash. The BugReporter API is a simple “C” interface, providing maximum compatibility with development environments such as Carbon or Cocoa. It is distributed as a stand-alone library, and requires no additional resources, frameworks, or bundles. It can be invoked from both CFM or Mach-O applications, packaged in either single-file or bundled form. BugReporter allows bug reports to be submitted through email or over the web, enabling you to pass bug reports directly from an end user’s desktop to your internal support systems. Plus, it’s a universal binary and supports both Xcode and CodeWarrior. It’s used by apps like GraphicConverter and TLA Systems’ PCalc and DragThing.